The “call of the desert” has been answered for centuries by a particular sort of soul. In fact, in the 4th century Middle East, as many people dwelt in the desert as in settled towns. People walked right out of civilization and into the wild, searching. Like those hermits, many 21st-century runners are seeking something deeper than the conventional. 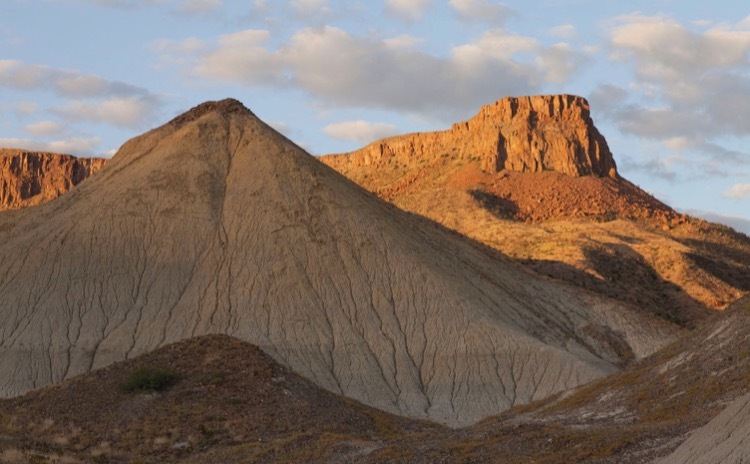 The natural place to look, where everything extraneous is stripped away, is the desert, described by Belden Lane in The Solace of Fierce Landscapes as a “laboratory for dealing with the self.” The ecology of the desert is minimal; what lives in the desert is only what can survive on scarcity, and not an iota more. That sort of austerity allows people to contemplate the things beyond the clutter, the superfluous. That is why some of the great ultrarunning events of the world are in deserts (the Gobi March in China and the iconic Marathon des Sables in the Sahara, for example) and why participants report that their lives are changed forever by the experience, scoured by sand, attenuated by a spare diet and sinewed by the day after day effort. 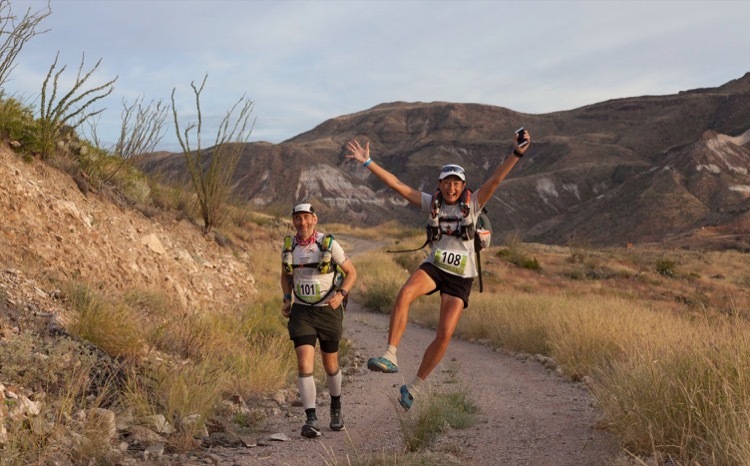 Until recently, all the great desert stage races have been overseas, but Americans are catching on, with events like the Trans-Pecos Ultra (TPU) in the vast Chihuahuan Desert of Texas and Grand to Grand Ultra (G2G) in the Arizona desert. The ethic. 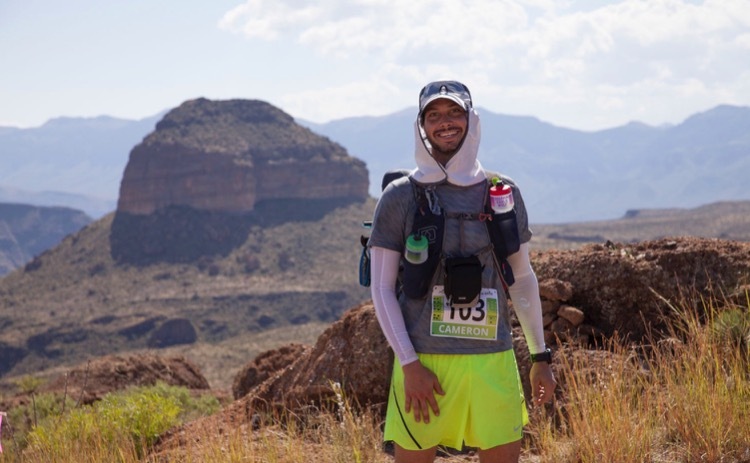 A self-supported runner carries all his needs on his back: nutrition, sleeping gear, safety and personal items. Races like the G2G and TPU provide only daily water and night camp (this is typical for self-supported stage races.) The ethic of independence results in a trail magic of sorts: you are at-home wherever you are. 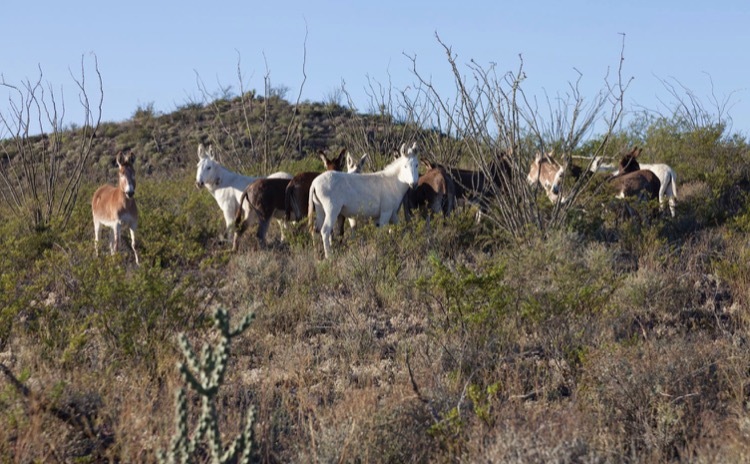 For a little while, you belong to the desert as much as the prickly pear and wild burros do. The desert landscape is an imaginative wonderland. In it, you’re taller than all the knee-high scrub around you, like Dorothy in Munchkin-land. You can see for miles. While that can be mentally challenging (“Are we there yet?”) it is precisely the gift of desert running. When you stop measuring distance, your mind blows past your accustomed boundaries. Your mind wanders and plays like a child unaware of time passing. The silence. We live in a world of noise: constant technological input; incessant music in cars, airports, and restaurants; never-ending news feeds. The desert is a digital detox zone, with no reception even if you bothered to carry in your devices. The freedom. When everything you need is on your back, and your only task is to reach the finish line each day, life becomes beautifully simple. These desert races reveal what’s deepest within, that which remains hidden as long as we’re in our comfort zone. The journey inward is never easy. If it were, we wouldn’t need to go into the desert (either literally or figuratively) to accomplish it. Many people will never undertake the journey, but some will: some introspective, searching, creative, Quixotic souls, will. At this time in the life of the world, maybe more than a few. Maybe this is a time like the 4th century, when people felt something essential was missing, and knew they must, at all costs, go in search of it. Maybe it’s waiting for you in the desert. Sheryl Collmer is a pilgrim of many trails, with a masters degree in theological studies. Beautiful article. 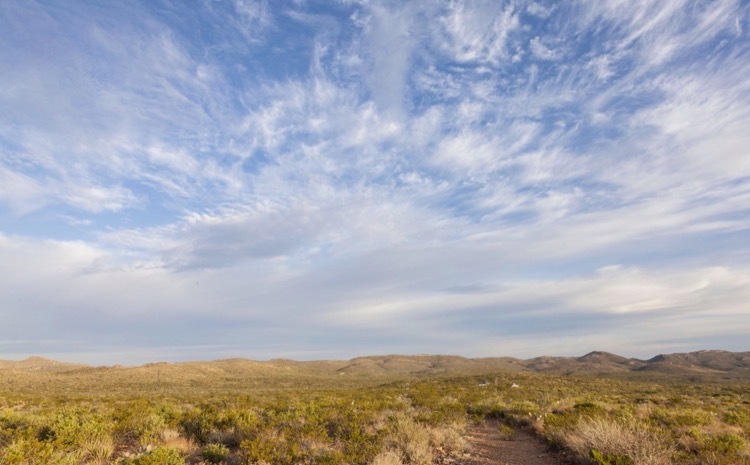 You’ve captured very well how enchanting and special is the Big Bend country. I’ll only add that one of the finest things about the Trans-Pecos region is something no prose can capture: the AROMA. It is the freshest, purest air there is, and the desert plants give it a complex, unforgettable scent — subtle in the dry times, but pungent and bracing after a rain or from the nightime dew when you first wake up in the morning.